We started the day with some news about super heroes, why not keep that going here at the end of the day (as well as rolling along the Year of New Editions)? 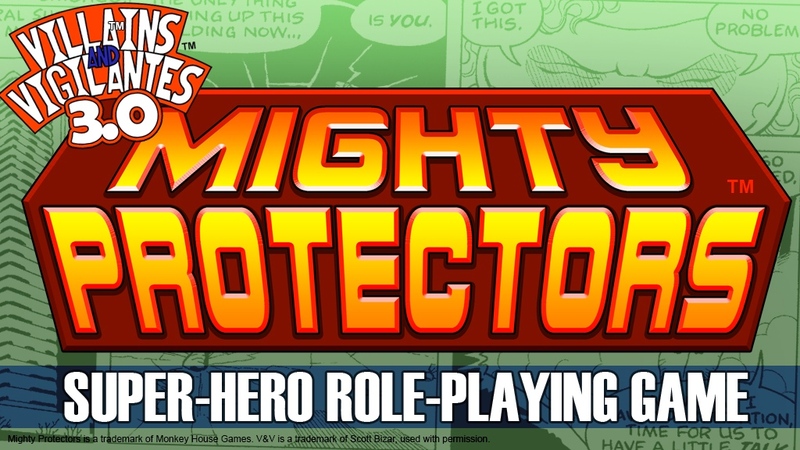 The folks over at Monkey House Games are running a Kickstarter for Villains and Vigilantes: Mighty Protectors (aka - 3rd edition). So, what does version 3.0 do to the rules? Well, there's refined character generation, letting you build characters of varying power levels (low, standard, and high), as well as expanded random-generation aspects (few heroes get to choose what sort of powers they get in the comics, y'know). Added to that, there's new super-abilities, as well as a reworking of previous abilities, giving the game a more-balanced feel, overall. You can even customize abilities, if you wish. But it's more than just character creation. The book also gives you a full overview of the Protectors Multiverse (something that hadn't existed in one place before). So if you want to know more about places like Central City or the Secret Land, you can. You can also find out more about the Crusaders, Shatterman and Condor, and the Protectors. The campaign's going along rather well, being more than 2/3 of their way to funding with still 27 days left to go.